Tile setters, tile layers prepare, conduct and finish tiling work on walls, floors etc. Organize the materials and the work area, e.g. gather and check required tools and materials. Check and prepare the surface, e.g. by cleaning, smoothing and applying adhesives. Set out tile distribution, and measure and mark the surface to be tiled. Mix mortar, glue or other substances to the right consistency taking into account e.g. tile weight and thickness. Make tiles the right size, e.g. using (electric) cutting tools. Prepare surfaces, e.g. apply mortar on floors and strickle off smoothly. 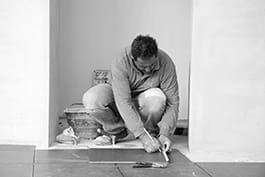 Set or lay tiles straight and evenly on the surface with mortar or glue, and press or tap the tile. Finish off the tiling work, e.g. finish and dress the joints and clean the work area. Carry out specialized tiling work (e.g. stairs, mosaic, patterns). Conduct repair and renovation work on tiling.